“It’s a heavy professional burden on the Captain to know he may be called upon to tap into the depths of his experience, the breadth of his knowledge and his ability to think quickly; weighing everything he knows, while accounting for what he cannot know”. – Capt. Chesley “Sully” Sullenberger. My work as a Human Factors instructor consists mostly of presenting CRM Initial and Refresher Courses, fitting these in-between flying a full roster as a line pilot. Every now and again however, there is an opportunity to run a Command Upgrade CRM Course for First Officers. Such was the case again last week, when I did the introductory day for a group of young Kenyan F/O’s and it once again reminded me of the major mindset change required when moving from the right seat to the left seat. Six KQ FO’s discovering their behaviour profiles in the Command Upgrade CRM class. Distance wise it may be a move of less than a metre, but it represents a major change in responsibility. As Captain Richard Phillips put it: “The Captain is responsible for the crew, the ship and everything on it. Period.” (Richard Phillips was the Captain of the Maersk Alabama, when it was hi-jacked by Somali pirates). In simple terms, ICAO defines the PIC (Pilot in Command) as “The pilot responsible for the operation and safety of the aircraft during flight time”. 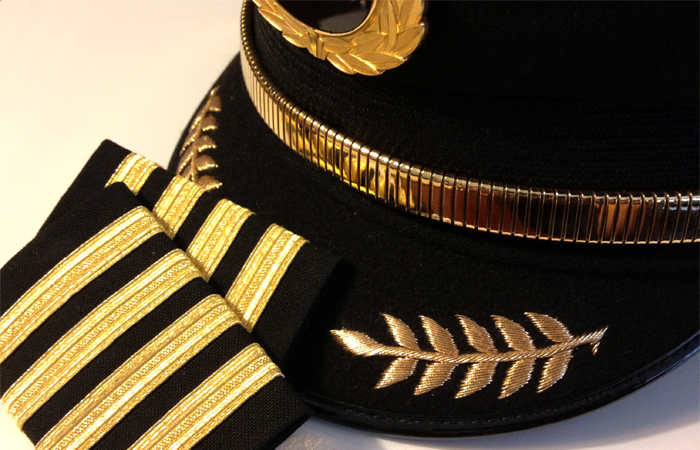 That responsibility covers vast areas of legal authority, essentially ensuring that the Captain’s authority overrides almost any other while the aircraft is in motion. The maintenance of discipline by all persons on board. To disembark any person or cargo, which in his or her opinion represents a potential hazard to the safety of the aircraft, persons or property. In short, the buck stops here. Captain Al Haynes, the hero of United 232 said that as a pilot you can never be ready, but you can be prepared (for any eventuality). And every flight is different, despite the general perception that routine flights become boring and, well, routine. Flying is like playing the piano: Sometimes you get to sight read a simple Three Blind Mice, other times you have to find your way through sight reading a Bach Toccata and Fugue. Or as a wise old Captain once said, it’s like playing bridge – you always play with the same 52 cards, but you are dealt a different hand every time. Then you also fly different aircraft on different routes with different crews – and as any pianist will tell you, different pianos are different to play, requiring some adapting. But there is a limit to how far you can and should adapt as PIC. You may experience intense pressure from line engineers, management, fellow crews and passengers to accept an aircraft, avoid a delay or push out at all costs. Yet at all times you have to balance that pressure with those imperatives of the law, which gives you the authority as Captain. Sully Sullenberger put it sagely – as Captain you have the power of the park brake – that aircraft goes nowhere until you decide to release the brake. As an interesting aside, the term “Captain” for the PIC is attributed to Juan Trippe, founder of Pan Am – he apparently decided that his flying boats deserved “Captains” as on ships. (The flying boats were also where the Pan Am call-sign “Clipper” had originated). Thus the First Pilot became the Captain and the co-pilot became the First Officer. To compete with ocean liners of the day, Pan Am offered first-class seats on their flights, and flight crews’ style became more formal. Instead of being leather-jacketed, silk-scarved airmail pilots, the crews of the “Clippers” wore naval-style uniforms and adopted a set procession when boarding the aircraft – hence our still wearing blue pants and white shirts on the flight deck today. But in the final analysis, the title of Captain would mean absolutely nothing if the pilot wearing those four bars is not willing, capable and able to accept the authority and massive responsibility that comes with the territory. Interesting article Eon, as usual. Thank you. Absolutely brilliant! You captured it all.